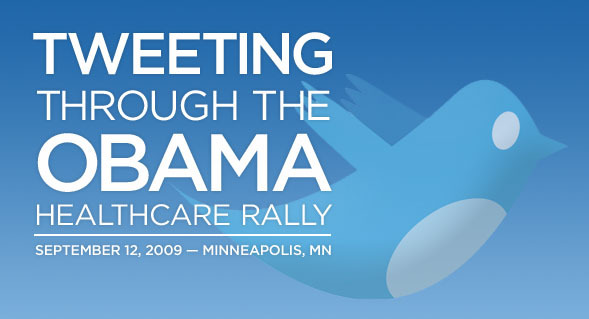 If I can get in, I’m going to attend the President’s healthcare reform pep rally tomorrow at the Target Center in downtown Minneapolis. Minnesota Public Radio, our fantastic, local National Public Radio station, put a call out to Twitter folk who would be attending. A couple of my tweeps (@intheloop and @sandentotten) tweeted about the need, I responded, and now they’re featuring my #Obama hashed tweets on MPR’s website starting tonight. Cool. I’ll do my best to be interesting. Tune in. 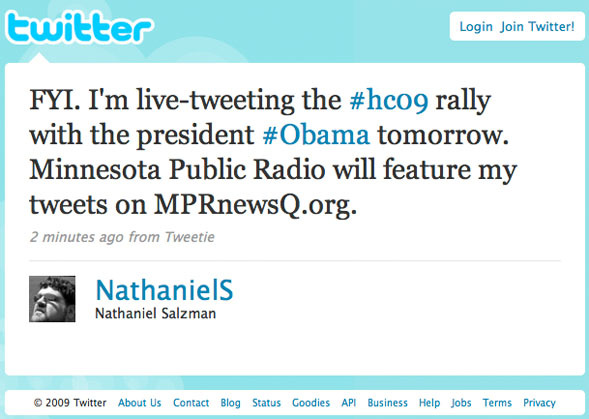 You can follow my twitter feed here on my site (<—- check out the side bar), on Twitter, or see my and about 5 other local peoples’ #Obama tweets at Minnesota Public Radio. Also, if you’re interested in my take on a healthcare solution, you can read the comment I made on this Fast Company article. UPDATE — Definitely a great event, especially on such short notice. The Target Center could have done better getting people in and out of the building more quickly, but we did finally get seated — in the worst two seats in the house. D’oh! Once the upper deck opened up, we headed upstairs and ended up with a much better view. Unfortunately, I couldn’t get any 3G service — so much for Tweeting. As for the event I really appreciated its focus and its brevity. It was not some droning, speechfest with speaker after speaker. Health and Human Services Secretary Kathleen Sebelius spoke first, both praising Minnesota on our successes in providing quality healthcare at low cost, and laying down a motivating reiteration of the need for nationwide healthcare reform. Her speech lasted only about five minutes, then it was time for the main event. President Obama appeared stage right, wearing in simply a dress shirt, slacks, no tie, and shaking hands with the edges of the group of medical professionals and other VIPs standing on the arena floor. President Obama was definitely the most dressed-down of the people presented on stage, but in a very down-to-business sort of way. He got right to it. Obama is known, even by his detractors, as a prolific speaker and that reputation is well deserved. What I appreciated most about his remarks was that they were obviously well prepared, but not overtly formal. That more conversational style made them particularly engaging, I thought. President Obama reiterated the need for reform — siting specific stories, situations, and injustices present in the current system, as well as encouraging us that reform is in fact closer than it’s been in about 70 years. He strongly emphasized that “the status quo is not a viable alternative.” He also refreshingly acknowledged that much of the opposition was more about “defeating Obama” than an objection to healthcare reform. His matter-of-factness is refreshing amidst the acrimony of this debate. The speech had its soaring moments, but mostly it was a nice mix of policy points and factual clarifications. At one point I was worried it was only going to only be overview without the all important details of how. For example, the “how we pay for it” question is one the President has been a bit light on the details. Thankfully, he did actually lay out a series of sensible and seemingly realistic ways that healthcare reform can be theoretically deficit neutral while ensuring forward funding for medicare. After outlining the policy plans in the most detail to date, President Obama took time out to specifically dispel many of the — hell, let’s go ahead and call them lies — being spread by the President’s fear-mongering opponents, the speech wrapped up with a simple story. He told us the origin of “fired up and ready to go” — how a single voice can change a room. How a room can change a city, a city a state, a state a country and a country the world. This was definitely the most soaring rhetoric of his speech. The place went nuts, of course, with the largest of several standing ovations given the President. That was that. We made our way out, hopped back on the light rail and headed home. The event didn’t change my views on healthcare, but it did give us all a lot more detail on the actual plan being proposed. This debate has been desperate for clarification, and between this and last wednesday night’s event, the President is starting to do exactly that. UPDATE — The White House YouTube channel just released the video of the President’s speech. Good stuff.